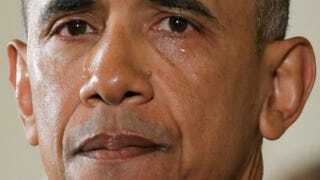 With tears running down his cheeks, President Barack Obama talked about the victims of the 2012 Sandy Hook Elementary School mass shooting and about his efforts to increase federal gun control by executive action Jan. 5, 2016, in the East Room of the White House in Washington, D.C.
About 15 seconds after President Barack Obama delivered a heartfelt, emotional series of proposals for gun safety, House Speaker Paul Ryan (R-Wis.) released a statement. Within five minutes after President Obama finished speaking, Reince Priebus, the head of the Republican National Committee, released a statement. The swiftness with which these statements were released means that unless the GOP had a time machine that allowed it to hear Obama’s mostly ad-libbed speech before he actually gave it, its members already knew what they were going to say and how they were going to respond before Obama even opened his mouth. Regardless of the GOP opposition, Obama simply proposed the kind of legislation that already exists throughout America. What is more important, however, is his confidence that gun violence in America is so bad that it will actually be a winning issue in the 2016 fall elections. That’s a new take on guns from Obama, and for the first time in his presidency, on this issue, he might be right. The most substantive part of the president’s executive actions for gun control is pretty mild. Essentially, Obama is expanding and clarifying what it means to be a “gun dealer” in America, which will cause more sellers to be responsible for conducting background checks. Until Tuesday’s action, you had thousands of people across the nation buying and selling guns, still in the original binding, as part of a hunting-vacation package or online, who were technically not gun dealers because the law wasn’t specific enough. And if you weren’t a specified gun dealer, you didn’t have to do background checks, which meant that criminals, terrorists and mentally ill people could buy guns from you and wreak havoc. Now all of these side-hustle gun sellers are required to do the same background checks on their customers as Wal-Mart, Target or Gander Mountain. And if they don’t, they run the risk of being prosecuted as illegal arms dealers, which is a pretty serious charge in America’s anti-terrorism war. The Republican political elite and candidates will call this unconstitutional, executive overreach. They will claim that expanding the definition of commerce and the regulation of actions are abuses of executive power that wouldn’t have stopped any mass shootings anyway. All of which is completely untrue. Nothing that President Obama proposed Tuesday would have necessarily stopped Dylann Roof, or the Oregon-college, Virginia Tech or Sandy Hook mass shootings. But his actions could slow down the actions of a potential killer, since he or she won’t be able to slip through the cracks to buy guns as easily as before. Republicans in Congress and some Democrats are never going to vote for substantive gun-safety reform, for dozens of reasons. In some cases it’s because of a different interpretation of the Second Amendment; in others, it’s the typical blind opposition to anything Obama proposes. Yet with some other members of Congress, it’s the fear of the National Rifle Association funding a challenger against them. The excuse many will use this year is that a presidential election year is not the time to engage in radical reform agendas. Rest assured, it has nothing to do with how voters actually feel, since 92 percent of Americans and 87 percent of Republicans actually favor universal background checks for all gun buyers. Which is actually the most significant aspect of the president’s speech Tuesday. On Tuesday, Obama essentially said that his executive actions can only go so far until we have a new Congress, even though that will happen after he leaves office. This is a bold and politically savvy statement heading into the 2016 campaign season because it suggests that Democrats, for the first time in history, believe that they can win on the gun issue. If Congress won’t listen to the polls, if Congress won’t listen to Obama and if Congress won’t even listen to its old colleagues who have suffered from gun violence, perhaps it will listen to the voters. Usually, Obama focuses on how his policies will solve the problems of gun violence. This time, he’s pretty clear that while his polices can help, an outside voting effort will be required to enact real change. Obama believes, even more than in the power of his executive orders, that the people of the United States are angry enough about gun violence to make a difference in the polls this fall, and he said as much. It remains to be seen how much of the public, or candidates, will pick up the baton and run with his idea. In the meantime, I guess we can be optimistic that government regulation can do for gun safety what it’s done for taco safety. And if not, there’s always Election Day.